«Together with Ventspils City Council deputies Ģirts Valdis Kristovskins, Dace Korna and Ivars Landmanis, I have turned with a request to the chairman of the Central Election Commission Arnis Cimdars, stressing that ongoing freeform interpretation by officials of the city council, responsible institutions and the election commission itself could potentially lead to unprecedented consequences – possible appeal and even dismissal of Saeima election results in Ventspils,» as mentioned in the statement made by Ventspils City Council deputy Aivis Landmanis. In their application to the chairman of CEC, deputies say that Saeima election, European parliament election, national referendum, and municipal election commissions, whose work is governed by Law on Elections of the Republic City Council and Municipality Council, in Ventspils municipality have breached requirements of the law. «After 2017 city and county council elections, the first meeting of Ventspils City Election Commission was organized. And it was organized in breach of the law, because it was organized by people who were never delegated such rights to begin with,» Landmanis’ statement mentions. «The meeting was not organized by the chairman of Ventspils City Council or a person authorized by him, as stated in the Law on Elections of the Republic City Council and Municipality Council, but with a written order from the 1st deputy of the chairman of Ventspils City Council. The meeting was organized by Ventspils City Council General Affairs Office manager’s assistant for organizational affairs Maija Krūkle,» the statement continues. Landmanis stresses that thereby Ventspils election commission commenced its work illegally. This means the election commission’s chairperson and secretary were elected illegally. «This means an illegally elected person is in charge of Ventspils election commission, which is currently in process of organizing 13th Saeima elections in Ventspils,» the deputy stresses. According to him, Section 19 of the Law on Local Governments, which states that the first meeting of a newly elected council shall be convened by the chairperson of the city or municipality electoral commission within the time period laid down in the Law on Elections of the Republic City Council and Municipality Council, and Section 25, which states that vice-chairperson of the city or municipality council shall act for the chairperson of the city or municipality council during his or her absence, were breached as well. «The meeting was not organized after election of Ventspils city chairman. Minutes were signed only by the chairperson and secretary of election commission. I stress that the chairperson of the election commission had no right to conclude the meeting, because in accordance with the law, her authority ends with election of the municipality’s head. It is also worth mentioning that opposite to requirements of the law, even when the chairman of Ventpils City Council is present, the council’s work is formally supervised by his assistants. This not only breaches Section 25 of the Law on Local Governments but also the legal restrictions applied to Aivars Lembergs,» says Landmanis. He believes such a situation has appeared as a result of negligence and even malicious actions by officials. «Responsible officials are well-aware that Aivars Lembergs has been under security measures for more than ten years. He is not allowed to perform duties as chairman of Ventspils City Council and Ventsils Freeport. 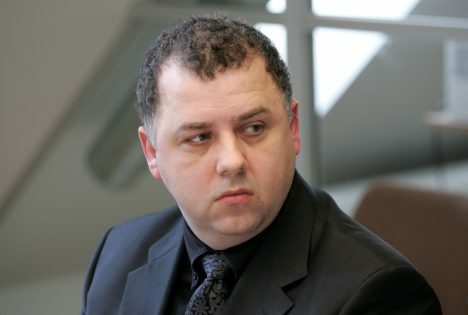 In spite of that, he continues working as both the mayor of Ventspils and chairman of Ventspis Freeport authority, making it impossible to apply multiple laws. Respectively – laws are intentionally breached, and high-rank officials, including those in the Cabinet of Minsiters (especially Environment Ministry), law enforcement institutions and the Central Election Commission all allow this to happen,» says Landmanis.